Silent Dagger learned about the massacre of the Bao men and sought an immediate audience with Crazed Raksha (Shen Chun) and the rest of the Golden Way. He sent out a message summoning everyone to a meeting. Min continued her negotiations with the craftsmen for her Cherry infused hook swords. She questioned the 6,000 spade price and closely examined his existing wares. She was pleased with the make and accepted the price once she realized degree of quality*. Everyone returned to the Hall of Golden Heroes. Crazed Raksha explained recent events to Silent Dagger. After they discussed matters, Silent Dagger, sensing some were troubled by the dangers of Dee, asked if there were any concerns. He also explained that they had made a deal with the Hua Pi and the purpose of being in Dee was to give them an area to control in Hai'an. One said "The sooner we leave Dee the better, but I will stay until we complete our task". Silent Dagger sensed that Xiaomin, his disciple, rolled her eyes and pressed her on the matter. Reluctantly Xiaomin, Silent Dagger's disciple, explained that she still hadn't found her father's identity (though most of the group had a good idea who the man was) and felt the matter hadn't been given enough priority. Silent Dagger said he would make it his priority once they finished their efforts in Dee. But he said he wanted to present when she met him, and that she wasn't to act without his orders. The party then went to the Gambling District to feel out the Vermillion Sword Sect (as Thundering Guan had given them permission to war with them). Silent Dagger managed to secure a meeting at Vermillion Hall to meet with Vermillion Sword. It was explained to him that all men were equal inside Vermillion Hall, that no formalities would be observed, and that the shedding of blood was strictly forbidden. The men of Vermillion Hall were dressed in red and never bowed. They asked for his weapons and led him into a central reception hall. Inside Silent Dagger met Vermillion Sword. Vermillion Sword stood before him on a dais, dressed in red robes. His face was tattooed and terribly scarred. His body was hefty and skin appeared to have been burned in a fire. "I don't want to waste a lot of your time," Said Silent Dagger. "I represent the Golden Way; are you familiar with our organization?" "Is your leader's name Shen Chun?" "I understand we have had a bad interaction with your allies the Golden Heroes," said Silent Dagger. "Yes, I predicted this would happen the moment you entered the city." "You have the power to see the future?" Silent Dagger asked. "Well, we are trying to get a slice of the action here, hopefully work something out with you guys. Thundering Guan actually suggested we take your territory, but we are tired of bloodshed. This isn't the way of the world. I think we can work something out." "I have been pondering this a long time and think this can be resolved without bloodshed," said Vermillion Sword. They continued to talk and worked to arrange a meeting with Crazed Raksha at Vermillion Hall but Silent Dagger was reluctant, thinking it might be a trap. "If it would re-assure him, tell Shen Chun that we have a mutual benefactor," Said Vermillion Sword. "I will be happy to explain in more detail to Shen Chun personally." It was finally agreed that Silent Dagger would bring his retinue, but Vermillion Sword stated anyone who spilled blood in the hall would be cursed by Heaven. The group returned to Vermillion Hall. Crazed Raksha asked one of the disciples why no one bowed or observed formalities in Vermillion Hall. "Our leader does not believe in bowing. He thinks all men are equals." They went to the reception hall and Vermillion Sword said he had been expecting Shen Chun for some time. "I suggest we unite the entire city, so Thundering Guan has no choice but to do what we wish." "Who is the mutual benefactor," asked Silent Dagger. "The same person who saved you at Stone Throne Bridge." Silent Dagger whispered to Crazed Raksha "But didn't Hidden Arrow's men deliver the fatal blow to Bao Yang?" Crazed Raksha spoke "So Hidden Arrow has his sights set on Dee?" "Hidden Arrow has been laying the foundations here for some time," said Vermillion Sword. "How much of the city would we need to unite?" "I think if we can get everyone united, that Thundering Guan would feel threaten, and we'd be free to do as we please." "Even the Fire Stick gang?" "Yes, we'd need them as well," said Vermillion Sword. "You do know we killed their Fire Crow King?" Said Silent Dagger. "Crazy as they are, they are still losing men," Said Vermillion Sword. "But even without them I think we can form an alliance that will pressure Thundering Guan to allow us to configure the city to our liking. Perhaps we will unite the sects, destroy the Fire Stick Gang, then divide the territory between us." "I like that plan," Said Ong. They discussed the details of how the city might be divided. They decided to make it about the Kushen district to unite the gangs. Once Thundering Guan stopped interfering, they would begin waging war against one another again and the city would reach a different balance. They nearly agreed but asked Vermillion Sword's relationship with Hidden Arrow. He said he had once pledged loyalty to him. And that he would be liberated from the agreement by coming to Dee at the appointed time. Silent Dagger pressed aggressively for more information. "I can tell you that Hidden Arrow has had his eye on Dee for some time, and sent me here to take this district and await the arrival of Shen Chun," said Vermillion Sword. "What does Hidden Arrow ultimately want?" "He wants me to rebalance the powers of the city. And he wants something that is under the city." "No, he doesn't want A'zhu." They agreed that they would work to formalize the alliances and then make their move. The Golden Heroes would work to smooth over the relationship between Five Ghost Society and Vermillion Sword Sect. Silent Dagger decided to go meet with Thundering Guan, while Crazed Raksha, Min and Ong would work out things with speak with Murder of the Five Ghost Society. Crazed Raksha met with Murder in his reception hall. "Crazed Raksha, what do you have to say?" Murder asked. "We are looking to unite everyone, except for the Fire Stick Gang," Said Crazed Raksha. "I understand you have grievances with Vermillion Sword. Can we smooth that over?" "Yes, I still have a grudge with them." "What are they willing to give me?" "There is much to be gained from an alliance." "What will I have that I don't have now if I agree?" Murder asked. "You won't have Thundering Guan preventing you from attacking people," Said Ong. "Who should I attack first Crazed Raksha?" "We will attack the Fire Stick Gang," Said Crazed Raksha. "I have no desire for their territory.....but very well I will agree to this provided you do not interfere when I make use of my new found freedom," said Murder. "The alliance will give us freedom, but we should consider how badly we weaken others, because the only reason Thundering Guan will stay her hand is because there are so many of us." "But Shen Chun, there is so much opportunity here, we can expand both of our territories well beyond our current state," Said Murder. "I feel there would be nothing but bloodshed," Said Crazed Raksha. "Someone would rise supreme....if you and I have a firm enough alliance, then we can become the masters of Dee," said Murder. "Yes I will join, but we must remain firm sworn brothers" said Murder. They then talked about the Iron Kings and smoothing over any issues they may have with Vermillion Sword. "You speak to the Iron Kings, and I will speak to the Holy Killers," Said Crazed Raksha. "Good, and we must speak soon to make our plans" Said Murder. As this was occurring, Silent Dagger tried to secure a meeting with Thundering Guan. First he went to Ghashir Manor and a meeting that started friendly turned violent, when Ghashir Al-Anmar refused to take Silent Dagger directly to Thundering Guan. Silent Dagger leapt across the room and put a blade to Ghashir's throat. "Please, I meant no offense, I only worry for your well being, Thundering Guan is enormously powerful," Said Ghashir with a smile. "You merely need to go to the Government Palace and tell them I sent you. But you are courting death." Silent Dagger spoke with two women dressed as scholars who refused him entry unless he left his weapons outside. Silent Dagger demanded entrance and said he was too powerful for them. That he would kill them all if they didn't let him in. "One of you stay outside," Said Silent Dagger. One of the women stayed behind, while the other went in. "So, what is your name," He asked her. As he asked the question hails of arrows darkened the sky and enveloped him. He used Iron Body and withstood the attack. Then thirty women dressed in scholarly robes leapt over the wall and attacked. Silent Dagger flashed a smile and tried to charm them with a few sweet words but they descended into the street. It was a chaotic battle. Silent Dagger evaded many and replied with strikes of his own. He wounded some of them, dropping one, but was struck with a jian. The blade sunk deeply into his flesh. Things began to look pretty dire for Silent Dagger as they circled around him. "Wait, I will surrender if you stop attacking me." They agreed if he put his weapons down. The women told him to leave. "No, I want to talk to Thundering Guan." "Only if we can bind you," they said. Silent Dagger objected, and said he could kill them all if he really wanted to. He let them tie his hands. They took all his weapons and vials. "Sorry about that women I killed," he said. They brought him into a hall before Thundering Guan. She was flanked by 60 people. He bowed and said "I came here to bring you an offer, can you cut me loose first though." "I am here to make a deal; are you interested?" "Are you familiar with Hidden Arrow?" "He is the leader of the Hidden Rakshas" said Silent Dagger. "He has his sights set on Dee and wants to remove you to achieve that. I am willing to help you out if we can reach some kind of arrangement. As you can see I am very powerful and could have killed your women scholars had I wanted to." "I don't think you could have and there is no reason to point this out to me if you are trying to build an alliance," She said. He then boasted that he would be destroying the House of Paper Shadows and suggested she should show him some gratitude. "Look I will make it simple," Said Silent Dagger. "Let us take over the Fire Stick territory and in return I'll bring a big army here to help take care of any invasion. We'll back any moves you want to make." "I could just kill you right here"
"Then cut my ties and let's fight," he said. "I already spoke with your leader and thought we had an agreement," Said Thundering Guan. "Now we can have a better agreement," Said Silent Dagger. "You will remain here and I will negotiate with your leader," She said. "I won't go along with that, so you'll have to kill me," he said. "Plus if anyone kills me here, I made arrangements so you will be cursed." "Don't threaten me with curses," Said Thundering Guan. "How many of these ladies do I have to kill before you start talking some sense," He said. She motioned for her people to attack him. He was surrounded. He managed to deflect several attacks but the numbers were overwhelming. He punched one of them in the throat, but she seemed tougher than the women he faced outside. Once again he surrendered and was bound. He tried to sweet talk the scholars but they led him to a cell below the halls. *The swords do Muscle + 1d10 Damage (instead of Muscle + 0d10). This was the Thirteenth session of a new Wandering Heroes of Ogre Gate campaign. See the TWELFTH SESSION LOG to read about the previous session. Wandering Heroes of Ogre Gate is our wuxia RPG. It is available HERE in PDF. Peng Biyu: Peng Pei's mother. In the Jade Temple, people recovered and healed with the help of the Abbess. Sister Fox remembered the pouch of tea-like ingredients she had found at the Temple of Jade Mercies and asked Song Pei to prepare it. They used it to make a warm drink, which Peng Pei, Shin Du and Sister Fox all consumed. They found it filled them with euphoria and vigor, but dulled their minds. When the sensations passed, they wanted more, and made another preparation of the stuff. Zhendao asked the Abbess and Biyu if there was a way to kill gods. The Abbess wouldn't comment but Biyu mentioned that there was something called the God-Killing Blade. The party left the Jade Temple and asked the abbess to join them. She felt it was better, in the wake of recent events, that their paths should diverge. 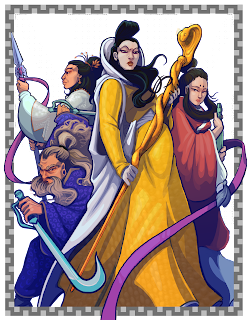 Shin Du, who had been growing increasingly wary of the group's methods and actions, decided he would go north with the Abbess to Daolu. The rest of the party decided to try and intercept Brother Wolf as he travelled to meet them at the Jade Temple (fearing he would run into one of their enemies in his weakened state). They travelled through the foot hills and were briefly followed by wolves before they found him. He appeared haggard and pale, and half the group rushed to greet him. Feiyan and Zhendao refused, both being extremely wary of Brother Wolf. They explained the situation to Brother Wolf, telling him about the talisman agreement that Ke-Yen had made. He told her that Dawa of the Ten Talismans never let people out of agreements. He would accompany them to the House of Paper Shadows to find this Hero Feng, but didn't think he was strong enough yet to assist them. Sister Wolf offered him some of her 'tea' which he took. This gave him more energy and awakened him. He asked her and Song Pei to find more of the tea-like ingredients. They decided to take different paths to Yun Hu. Zhendao and Feiyan would travel together, while the rest of the group travelled with Brother Wolf. During the journey, Ke-Yen seemed to be having doubts. On the way, Feiyun and Zhendao passed by a man carrying a square wooden box. Zhendao called after him when he realized he was dressed like a merchant. "Want to buy some wolf pelts?" He tried to negotiate a price, but the man, who said his name was fox, told him the pelts looked terrible and obviously hadn't been cleaned. The man explained that he was an antique merchants anyways, so had little use for wolf pelts. Zhendao asked him about the God-Killing Blade. He said he had heard of it, that it was referenced in an old poem. Zhendao asked him what was in the box. He said that wasn't for him to know. Both Zhendao and Feiyun were curious about the contents of the box. But they said nothing more as the man left on his way. They arrived in Yun Hu and Song Pei went to the Banyan Sage Apothecary to obtain information on their tea-like ingredients. Hong Mai was rude to Zhendao, who left and went to speak with Xiaomin at the nearby cave. Zhendao spoke with Xiaomin and asked her about a blade someone had mentioned to him, the God-Killing Blade. He had previously learned the weapon was mentioned briefly by the Demon Emperor in a poem and wanted to discover more. Xiaomin knew little, only telling him that the Holy Killers in Dee were known to be interested in the weapon. Hong Mai told Song Pei that his pouch contained Celestial Plume, which ought to be burned like an incense, otherwise the potency would be wrong. Song Pei thanked him and they purchased some more Celestial Plume at the Singing Reed for thousands of spades. The price they were told, would be cheaper if they bought it in Dee. The party spent a great deal of time talking about their next course of action. They would go to the House of Paper Shadows to rescue Hero Feng, but Zhendao wanted to go to Dee as well. Since both were in close proximity, they could reach both. Song Pei made preparations to procure passage on a ship. In the mean time, Ke-Yen retreated to her room to meditate. She remained there for almost a day and when the party found her, her hair was pinned up, and she had a gecko-cinnabar dot on her forehead. While Brother Wolf slept, she placed her talons on his bed. As Brother Wolf recovered he spoke with Song Pei, explaining the importance of filial piety to him. He taught Song Pei the basics of Plum Blossom Palm*. The party then discussed Brother Wolf. They were very divided on him. 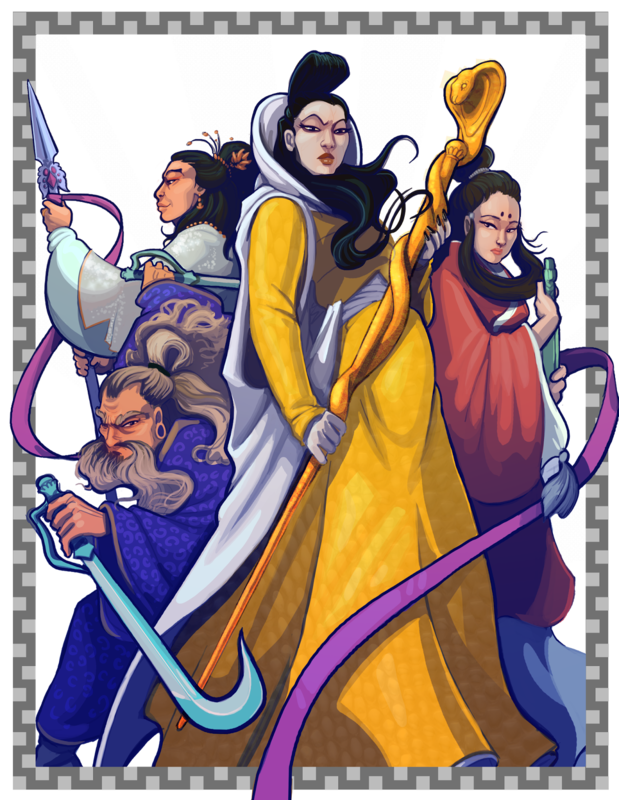 Sister Fox wanted to protect her brother, Song Pei appeared to still be loyal to Brother Wolf as his master, but Feiyan, Zhendao and even Ke-Yen were concerned about remaining with him. They decided to encourage him to stay at the Sword and Wine Inn. Peng Biyu and Peng Pei did not weigh in strongly one way or the other. They would travel to the House of Paper Shadows and deal with the matter after they returned. Incidentally, Song Pei had learned that Celestial Plume produced a strong dependency, which would kick in after ten days without the substance. He began to divide the doses so that this would not negatively impact their venture into the House of Paper Shadows. The party traveled to Xuanlu by boat the next day. Then they walked to the House of Paper Shadows. As the party talked tactics, Zhendao grew bored and began climbing the wall. Feiyan, who had been inside the House many years before, joined him and helped lead him toward an area she felt Hero Feng might be held in. The party did go into the house, but since the House of Paper Shadows is an upcoming module, I will resume the session logs when they leave the house (to avoid spoiling things for people who might play the module). *Note that this is not a technique Brother Wolf knows in the official materials of the game. In my original campaign he has ranks in Dianxue and knows pressure point techniques. This was changed for the Maidens of the Jade Blue Sky book. I talk about an upcoming module, the podcast and some observations about running Wandering Heroes of Ogre Gate. I review Painted Skin: The Resurrection. Directed by Wu Ershan, this 2012 film stars Zhao Wei, Chen Kun and Zhou Xun. 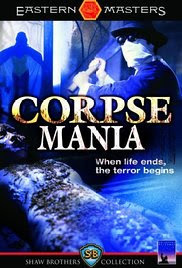 Here is my Corpse Mania Review. Going to try doing some of these as podcasts. 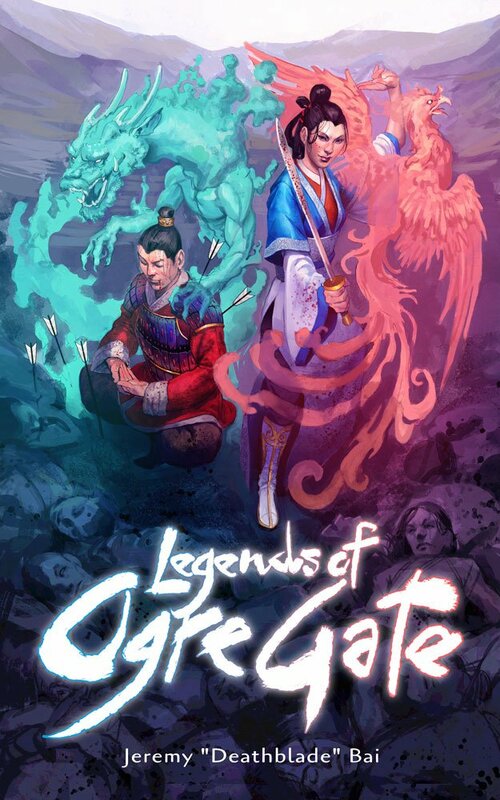 Just wanted to let everyone know that Legends of Ogre Gate, the web novel of the story of Sunan and Bao, has been released on wuxia world. This past week the writer, Deathblade, released the prologue and the first three chapters (It will follow a two-chapter-per-week release schedule). Deathblade is a translator at wuxia world. He has translated several wuxia novels by Gu Long and translates many of their xian xia web novels there as well (including I Shall Seal the Heavens and A Will Eternal). As Shen Chun and Little Bai recovered at the Five Ghost Society, Min and Ong wandered around the Craft Market Quarter and went to the High Minded Phoenix Tea House. While there Ong ordered 9,000 spades worth of duck and tea, then had the debt sent to Shen Chun. As they were leaving, they happened upon a group of men attempting to murder a local sheriff. They stopped the attack and Ong used his Lashing Tiger strike to knock all but one to the ground. The remaining man asserted that they were operating under the protection of their Bao Chief, Sunan Li. Ong commanded them to bring Sunan Li before him. Sunan Li arrived, smiling and jovial. He asked Ong to speak in privacy, and then told him that the sheriff was a thorn in his side, and he had both the protection of the Five Ghost Society and the support of City Lord Buwei. When asked for an explanation, Sunan Li told him that the sheriff was too diligent in enforcing the law, and that this went against the local agreements. He essentially had permission from Buwei to eliminate him for the betterment of all in Dee. Ong was naturally suspicious and told him not to kill the man, but that he wouldn't interfere in their affairs. Sunan Li was pleased, approached the sheriff and publicly apologized for his men's behavior (he also gave the sheriff strings of cash for his troubles). By this time it was evening and Ong and Min then began heading back to the Five Ghost Society. On their way, they heard commotion from the area of the city the Golden Way controlled. When they reached the Bao under their control, they saw people taking wounded and dead from their houses into the street for care. They asked what happened and one of the Bao-men told them to speak with Yao Min, the chief of the area. They found Yao Min, who was directing men and covered in blood. She told them that her Bao had been attacked as people went to bed, men had snuck into their homes and killed the weak. She feared as many as one thousand had been killed in the attack. She believed that it was the Fire Stick Gang and their Bao-men. She went with them to deliver a report to Shen Chun*. Yao Min explained the situation, telling him she had sent some men to track down the attackers, and she would report on news when she received word. Shen Chun inquired about Yao Min after she reported and discovered she was well respected, and the only female Bao chief in the city. In the morning Yao Min sent a message to Shen Chun stating that her men had followed several members of Fire Stick Gang to a warehouse in the Kushen District. The party discussed what to do. It was decided Shen Chun would go to the previously arranged meeting with Ghashir Al-Anmar, while Min and Ong went to the warehouse to investigate. At Ghashir Manor Shen Chun was brought before Ghashir Al-Anmar, who greeted him kindly and exchanged pleasantries. "We are new to Dee" said Shen Chun. "We like how things are handled here and are looking to get more of a grasp on the area. I think purchasing your Celestial Plume would be most influential for us." "Well," said Ghashir, "My Celestial Plume is of course the best in all the world. But sellers must go through the Fire Stick Gang." "Have you heard what has been going on with Fire Stick Gang." "I have, and I fear for anyone who incurs the wrath of the Celestial Phoenix Gang." "If everything goes according to my plans, then I should be forming an agreement with Celestial Phoenix and eradicating the Fire Stick Gang," Said Shen Chun. Ghashir thought and said "Well then let me tell you how this works. You give me protection, and I give you a cut of the sales of Celestial Plume. You can even sell it in your own district (but not in other districts)". "That seems agreeable, what numbers did you have in mind." "Well first we must see how the matter of the Fire Stick Gang resolves." "We've killed another Fire Crow King and will kill any more who stand before us," Said Shen Chun. "In that case I suggest you speak with Thundering Guan before she takes action against you. You seem like someone I can work with, but there are many 'ifs' here." Ghashir offered to arrange a meeting. Shen Chun left and awaited word on the meeting at the Five Ghost Society. By the afternoon he received a message saying that he was to meet Thundering Guan at the City Lord Manor and that he could only bring with him one of his female disciples. Meanwhile, Ong and Min found the warehouse in the Kushen District. They approached and waited outside to observe it. They saw a man open one of the doors and peak toward them. The two then noticed that there were archers preparing to strike them from windows and roofs of nearby houses. They charged into the building to evade the impending attack. Min did so using greater stealth than Ong. When they got inside they saw terra-cotta figures filling the building in rows. In the center of the room were a group of men, one of them held a cord in his hands that connected all the figures. He ripped the cord and an explosion blew open the doors. Min whirled out of the way and into an alley. Ong stood in the center of the blast, feeling the burn of its heat and the force of its rapid expansion, but when it was over, he still stood. The men in the room were dead, and chunks of terra-cotta were strewn about. Ong remained inside while Min used a blast of Qi, hurling tens of archers to the ground. They unleashed arrows upon her and was hit by one. She ran to the roof and stabbed at foes along the widows, dropping many more to the ground. With another blast of Qi she pulled the rest into the streets to their deaths. She and Ong hid in the aftermath, awaiting any more Fire Stick Gang members. Shen Chun went to meet with Thundering Guan. She was in a great reception hall. She was dressed like a scholar and thirty women with similar attire flanked the room. Shen Chun greeted her and she reciprocated. He then asked for an alliance. "Why should I ally with people who kill my friends in the Kushen District." Shen Chun claimed they were unruly, and that the Fire Stick Gang has a longstanding grudge with his group. He informed her of Little Bai's dealings with them in Gaoxing. "It would be unseemly of me to hand you the Kushen District after your brazen attack," She said. "We had no intention of it being blown up, we were just looking for a meeting with the Fire Crow King." "How about this. I will put an end to the conflict with the Fire Stick Gang, I will forgive your extreme insolence, and I will permit you sell Celestial Plume in your district." "What about the Fire Stick Gang killing one thousand of our people?" He asked. "That is punishment for attacking them. I can arrange a mediation between you." "I am not asking to be handed the Kushen District." "That is what this sounds like to me," She said. "However if the Fire Stick Gang did disappear I would not expect to get their land." "Then who would get it?" "I suppose it would be whoever claims it," Shen Chun said. "That sounds like you have your eye on the Kushen District." "I do not necessarily have an eye on Kushen District. I just don't like the Fire Stick Gang and find them irrational. They are barbaric." "And your people are less barbaric?" "We don't do barbaric things because we worship fire. We do barbaric things for power." "That is even more dangerous," She said. "I just want a slice of Dee." "I've heard you already control a slice of Dee." "We control but a single Bao, and many of the residents were just killed." "Most gangs control two or three Baos, one should be more than enough for newcomers to our city. I don't like people having more than three baos." "I am uncomfortable with you taking the Kushen District after such an obvious attack on my territory. I can direct you to another, for instance the Gambling Quarter. We can work something out." "It is the territory of Vermillion Sword Sect and would give you control of the Xiang-Pu Wrestling Hall and Ouyang Gambling Hall: the Twin Vermillions." The negotiations went on with Shen Chun continuing to press on the matter of the Fire Stick Gang and she agreed to consider his requests, but no clear resolution was reached. As they left it, he agreed to end the conflict if the Fire Stick Gang stopped its attacks. She essentially told him by the end, that all the Bao chiefs were ultimately loyal to her and not their gangs. That any who opposed her directly knew the consequences. Back at the warehouse, Ong and Min saw a group of twenty six Fire Stick men arrive an hour after the ambush. They approached the warehouse and Ong unleashed a storm of arrows upon them. Min then crushed them with her Qi attack. In the end six were left alive and they dragged them back to Five Ghost Society. There, Shen Chun took the prisoners and tried to learn information about the Fire Crow Kings. He asked how many they were. With each refusal his rage increased. He smashed the head of one into the floor, crushing his skull with strike after strike. When the prisoners continued to remain silent, he twisted the arm of one until he died, then ripped it out and beat another with it to death. This carnage continued, and as it did, fury welled up in Shen Chun. Finally one said that there were three hundred. But Shen Chun took this to be a lie. "I hate liars," He said. And proceeded to savagely beat them to death. Elsewhere in the Five Ghost Society, members of the sect described the scene to one another and a new name began to replace Shen Chun. They called him the Crazed Raksha. Even by the standards of the Five Ghost Society, his behavior was viewed as cruel and unpredictable. In the wake of this, Ong and Min tended to some matters of importance to them. Ong went outside the city with his Gushan heads and summoned a storm to receive a prophecy. The wind blew and the heads uttered "You will change a historic event". After that Min found a smith to forge a sword infused with the ashes of a cherry blossom tree. He agreed to make her two hook swords for 6,000 spades. *Dee is organized into 24 sections made up of 1,000 households each. These are called Baos and the they are each led by a chief. The purpose of this system is for the Baos to self police and help maintain order, however in Dee these have slipped into criminality themselves, and most Bao chiefs answer to more powerful gang leaders. In this case, Chief Yao Min answers to Shen Chun of the Golden Way.